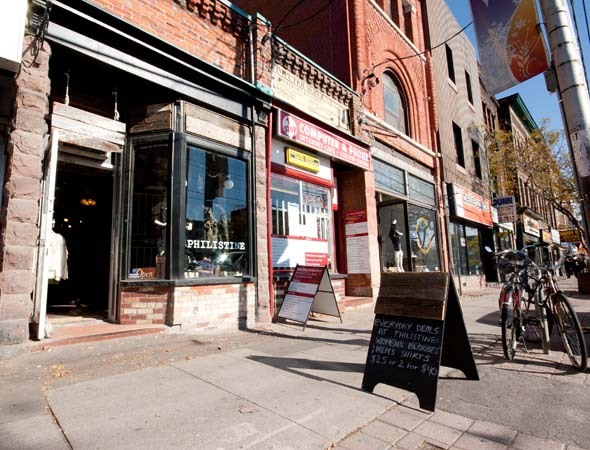 Philistine was founded in 2007 as a once-per-month pop-up shop, but only settled into permanent Parkdale residency this September. The tiny space houses mostly vintage duds (peppered with choice new accessories) curated by co-owners Aaron Doucet and Colleen Ramage. Doucet shares intentions to amp up the content of new items in the shop, including plans for their own line. Samples of the in-development brand - camel and black houndstooth capes - hang above the women's wear. In men's vintage, workwear and Americana rule. I feel like I've stumbled upon the time capsule closet of Springsteen's Born in the USA days. Well-worn-in demin, barn-collar jackets and down-filled vests are perfect seasonal toppers for plaid flannel button-ups. 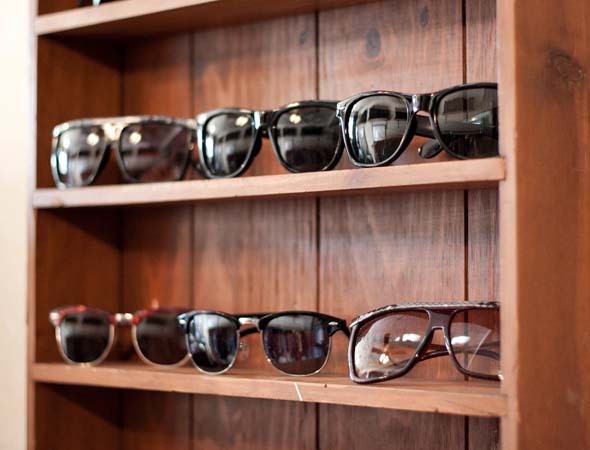 Fellas can channel The Boss or even Paul Bunyan, in pieces that are ruggedly, classically manly. While the shop's menswear collection feels unified, I don't detect a clear story in the women's racks. "Colleen is really into making it contemporary," Doucet explains, "She alters everything herself." Altering the pieces means shortening dresses and converting leather pants to shorts, to mimic what's happening on runways. 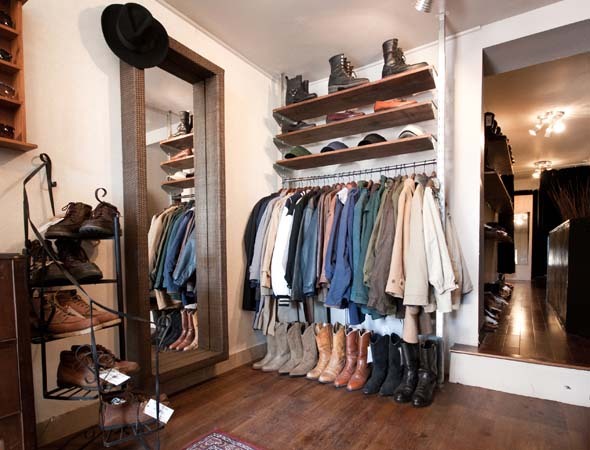 A narrow rear hallway is lined with an impressive (and massive) collection of immaculate vintage footwear. 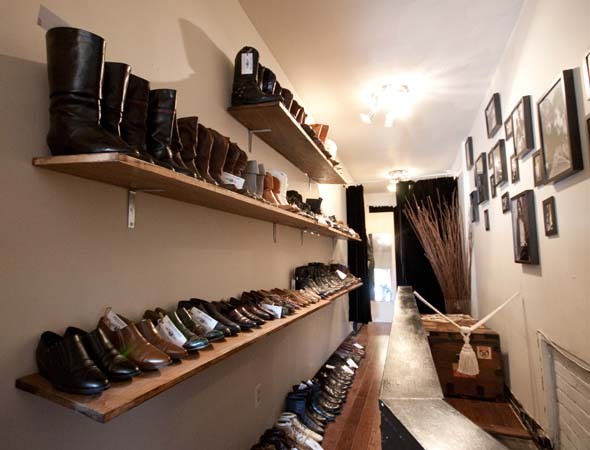 Bestsellers include booties for women, and, naturally, work boots for men. Shoes are priced from $20. Notable finds are light grey fold-down suede ankle boots ($40), a button-up short leopard jumper ($35) and new tortoise Clubmaster-style shades ($15). There are deals to be had here too - all button-ups and blouses are $40 for two. While I didn't find many pieces that I couldn't live without, I'll be back, curious about the evolution of the shop. 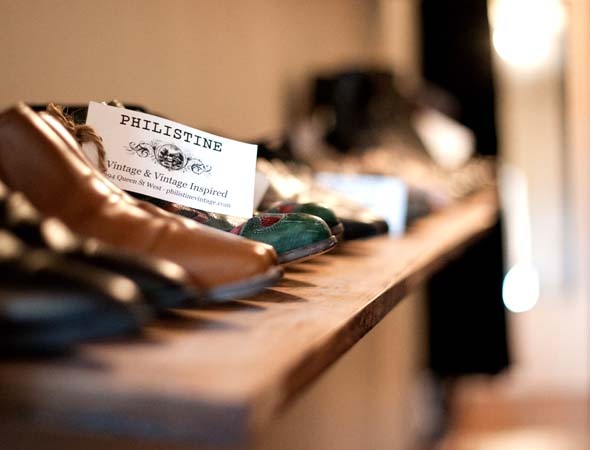 For the wood-choppin', grown-up boy scout types, however, Philistine is a must-visit.